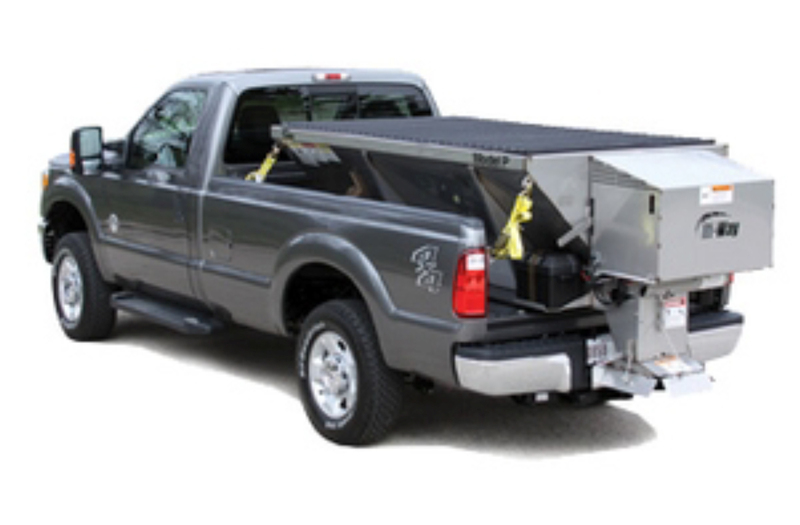 Designed for use with trucks rated at 8600 GVWR, the Model P comes equipped with four 2" (5.1 cm) nylon ratchet hold-down straps to safely secure the spreader in place on a flatbed truck or in a pickup box. The hopper body is primed and pained with two finish coats of Hi-Way yellow plural-componet urethane paint and then oven cured for maximum durability, prolonging the life of your equipment and further increasing your return-on-investment. Optional equipment on the Model P includes corrosion-resistant 304 stainless steel construction (shown); 11 horsepower Honda engine; dual hydraulic drive for independent control of spinner and conveyor; two piece, flip-up screen; inverted "V" to reduce conveyor load; polyurethane spinner; swing-way spinner; extended spinner for flatbed and dump body mounting; and integral side extensions for increased payload.